In the previous article we discussed type converters. Type converters come handy when you want to accept property values in plain text form. However, at times you may not want to allow the user to enter text values directly. You may want to present a custom value picker in the form of a dropdown control or a dialog box. This is possible with the help of Type Editors and this article examines them with an example. A type editor is a class that derives from UITypeEditor base class and provides a way to pick up property value from a custom dropdown control or dialog box. There are certain type converter classes that are inbuilt to the .NET framework. For example, when you create any property that is of type Color or Font the property window automatically displays appropriate value picker controls (see figure below). The first parameter to the [Editor] attribute is the type information (Type instance) of the class that is being attached as a type editor and the second parameter is the type information of the base class of the type editor. 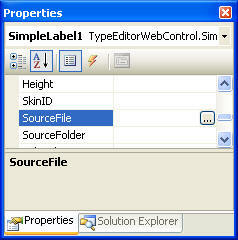 If you consume the SimpleControl on a web form you will notice that the SourceFile and SourceFolder properties show ellipses in the property window. Clicking on the ellipses open a file open dialog and folder selector dialog respectively. The Text property shows a multiline text entry region. As an example we will create a dropdown type editor for selecting predefined color values and a dialog based type editor for accepting a property value. We will call them as ColorTypeEditor and TagTypeEditor respectively. By convention type editor classes are named as XXXXTypeEditor where XXXX is the data type they deal with. 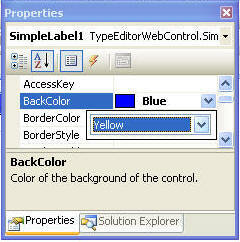 Add a new project of type Windows Forms Control Library to the existing solution. Rename the default control to ColorDropDown. Drag and drop a combo box on it and add three fixed color values namely Red, Blue and Yellow. The SelectedValue property simple returns a Color value depending on the selection. The form consists of a textbox and two buttons. Set the DialogResult property of the OK and Cancel buttons to Ok and Cancel respectively. 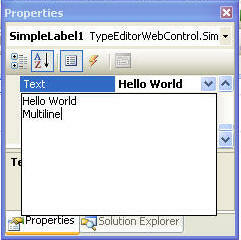 The windows form contains Value property that simply returns value entered in the textbox. Now add a new class to the web control class library (where you created SimpleControl class) named ColorTypeEditor and inherit it from UITypeEditor base class. In the ColorTypeEditor class we need to override certain base class methods. The first method being GetEditStyle(). The GetEditStyle() method governs whether we want dropdown value picker or a dialog box. The UITypeEditorEditStyle enumeration has three values viz. DropDown, Modal and None. For the ColorTypeEditor we want to display a dropdown with fixed color values to pick from and hence we return editor style as DropDown. 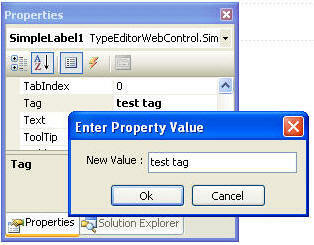 The EditValue() method returns the selected value from the dropdown or dialog to the property window. It first gets a reference to what is called as windows forms editor service and then calls DropDownControl() method by passing an instance of the windows custom control we created earlier. This way the property window will present that control to the user while editing the property value. Finally the SelectedValue from the ColorDropDown control is returned to the caller. The PaintValue() method simply draws a filled region with the appropriate color using the Graphics object. The code shown above is similar to the previous case except with few differences. Notice the lines marked in bold characters. This time we set the editor style to Modal i.e. dialog box and use ShowDialog() method passing an instance of the Windows Form. Notice how the [Editor] attribute is used to attach our custom type editors with the properties. 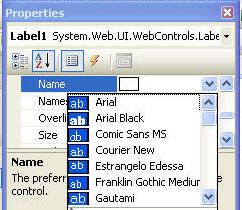 The following screen shots show how the custom type editors look like in the property window.